During a recent sit down with Billboard, the “Motivation” singer shared a few details about her highly-anticipated return to music. “This is by far the longest, most pressure-filled process ever, only because I know what it’s supposed to be and I have been so hard on myself,” Rowland revealed to the outlet. 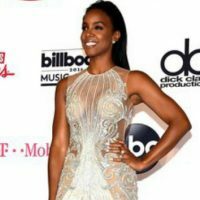 Late last year, the mother and newly appointed Fabletics brand ambassador treated fans to her first single in five years, “Kelly.” The bass-heavy track totes comes with all the braggadocious flair of Rowland’s previous days as a member of Destiny’s Child. And speaking of D.C., while Rowland insisted her recent sightings with Beyonce and Michelle Williamsare simply a “family” matter and not a reunion, she did admit to being open to working with Beyonce’s sister Solange again. Solange has penned songs in the past for Kelly’s solo releases. While the details surrounding her fifth studio album’s release are scarce, Rowland teased that she’ll be throwing it back a few decades: She’s been deeply inspired by the golden age of hip-hop. “I’ve totally been in that ’90s headspace,” she says of the album’s mix of old and new-school sounds.